The Midtown District is home to iconic Bozeman businesses such as the Lewis and Clark Motel, the Haufbrau House and the Community Food Co-Op. In past years, development has been focused on Main Street and east of town, but that is expanding. With Tax Increment Finance Assistance, Technical Assistance Grants, and streamlined urban zoning, investors are jumping on the midtown opportunity. Focusing on housing and retail, the plan centers around urban density and infill. Sidewalks and bike lanes are being expanded to make walking and biking easier, and with new entertainment options on the horizon, midtown is going to be a desirable locale for locals and visitors alike. What’s new or in the works? 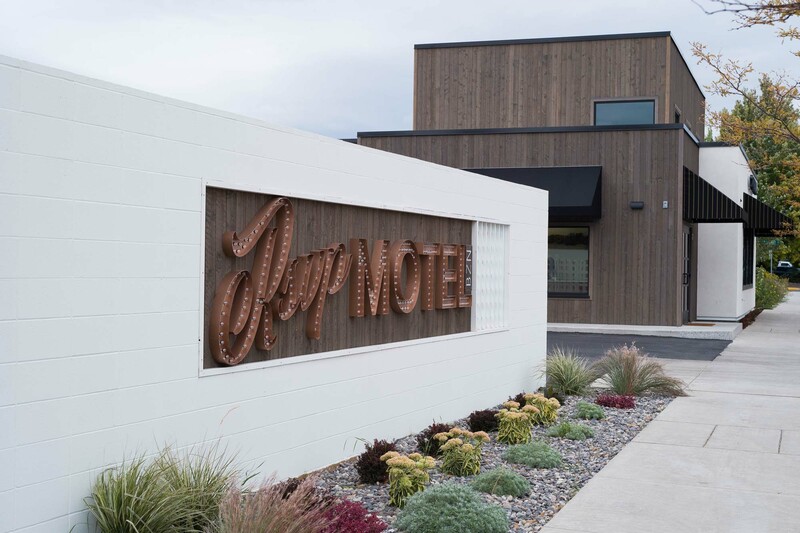 Formerly the Rainbow Motel, a 1960’s era motor inn, this accommodation has been newly refurbished into a boutique hotel, complete with champagne on arrival, artistically designed rooms and delicious food from The Farmer’s Daughter. Bozeman-ites love their music, and we can’t wait for this (yet unnamed) 1,700 person capacity music venue to open. Adjacent to the RSVP, the 2-story concert venue will double as an event space. Bozeman’s original pizza parlor made a come-back a few years back and is now in the process of opening a second location, including the North Side Brewery! Re-vamping the former Village Inn Pizza Parlor, the building is staying true to it’s roots. This fine furnishing resale store focuses on slightly used, quality furniture, clothes, accessories and jewelry. Not your run-of-the mill resale store, the inventory is constantly changing, the quality is stellar and the prices are affordable. Located on the corner of Durston and 7th Avenue, this proposed brewery and residential building would sit between two residential neighborhoods, making it an ideal gathering spot for a cool beverage on a hot day. Currently in the planning process, Aspen Crossing is slated to be a 68,000 square foot building combining retail, restaurants, a market-type event center, offices and 25 condominiums. This entertainment hub is going to be a welcome addition for residents and visitors alike! Midtown has been the preferred locale for many of Bozeman’s favorite establishments throughout the years. Anchors in the area, these businesses enjoy a robust following. This upscale home furnishings, art and jewelry store makes its home in a former oil change building. The eclectic nature of the interior is perfect for the space. Once a fine Italian Restaurant, Midtown Tavern underwent a facelift and is now one of Bozeman’s best sports bars. It’s family friendly, so don’t worry about bringing the kiddos in to watch the big game. Margarita lovers are known to hit the patio at Santa Fe Reds. Offering a variety of flavors, tasty food and a great outdoor space, it’s a summer favorite. There’s no such thing as too much Mexican food and Fiesta Mexicana holds its own with some of the most authentic. The restaurant is staying in the ‘hood, but eventually moving to a new location right on 7th Avenue. North 7th Avenue is easily accessed from I-90, and full of conveniences; auto services, restaurants, hotels and soon a plethora of entertainment!